Honey bee venom is a colorless liquid. After drying, it is a white powder-like material if protected from oxidation. If it is not protected, oxidation will change the color from white to brownish-yellow. Changes caused by oxidation of certain components of the venom may decrease its healing effect. There are different kinds of venom such as: pure whole dried, whole dried and freeze-dried (lyophilized) bee venom. Pure whole dried bee venom is the purest venom. It is white in color (often it is snow white), not contaminated with foreign materials and colorless when it is used in a solution. Whole dried bee venom may be contaminated with pollen, feces, dust, nectar or honey. Its color varies from yellow to brownish-yellow which depending on the oxidation of the components. In solution form it also has the same color. Freeze-dried bee venom is highly processed and purified venom. During the preparation its moisture content and any other contaminants are removed in order to purify and preserve it. Some of the active components may be removed also if an uncontrolled purification method is used. 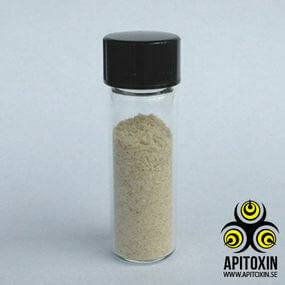 It is widely used in creams, liniments and ointments. In a tablet form, it can be used to prepare venom solution for electrophoresis or ultrasonophoresis applications. It is easy to sterilize with syringe filtration. If bee venom is protected from moisture and light it can be stored for five years or more. It will not lose its toxicity, however its healing effects are reduced by storage. Freeze-drying is perhaps the most effective method of preserving bee venom.